Yikes! Another YEAR just went by and you still haven’t found what you are looking for? 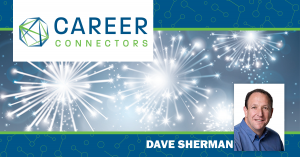 If you’ve watched the calendar turn another year while your career plans got stuck somewhere back in March, then Dave Sherman has some tips for you! 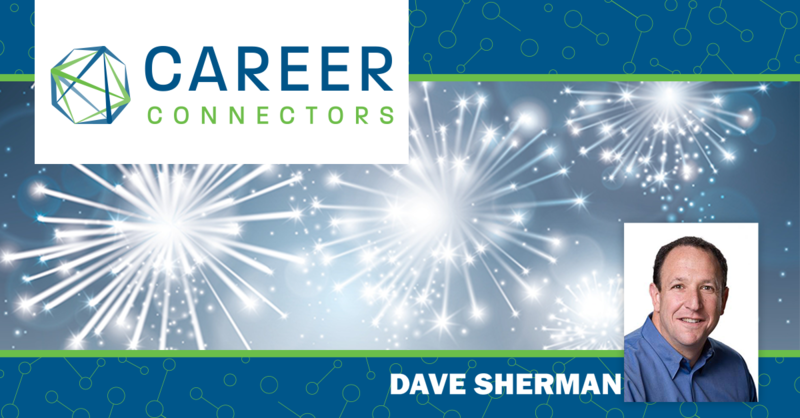 Dave was one of the first presenters at Career Connectors when the organization was just getting started and returned this week to kick off the new year, bringing a fresh focus and energy into your job search. He is now an entrepreneur, speaker and author of 3 bestselling books on networking and sales. Dave was once an employee who had never been fired, a ‘what, me worry’ type of guy, until he was laid off and went through a frustrating job hunt experience. His talk exudes a sense of urgency and gives clear reasons and encouragement to get up and start again. Sometimes we find it easier to worry and put things off, rather than making a decision that’s actually good for us. It’s as if we prefer being terrified and keeping ourselves up at night instead of taking the first step toward making a change. When we feel overwhelmed, fear can take over and push aside logical thinking. INDECISION – It’s easier to stick to a decision once it’s made. Make the first step a small one – a very small one if necessary, so that it’s easier to make a commitment. EXPLANATIONS – Beware of explaining away indecision. Excuses can come from your own self-doubt or from those who say you can’t do something, that you don’t have enough training or experience. Stick to your decision on why you’re doing this, so you can take the next steps to explore new paths and take it as far as you can go. VALIDATION – Get support from select friends and family who know you well and understand your challenge. NEGATIVITY – If you know you’re making the right decision for yourself, avoid those who say or imply that you can’t do it. Spend more time where you’ll be encouraged. If you are on social media, spend more time on LinkedIn which is almost all positive. Dave is a dedicated movie buff. But he doesn’t go out just to see any movie. Like you, before committing a few dollars and a couple hours in front a screen, if a movie title attracts him, he’ll want to know the genre, what the critics are saying and if it’s now playing in a theater near him. Same thing with your job search, you wouldn’t want to go for just any job posted out there. Get a sense for the needs and problems companies are trying to solve and how you might be able to provide help. To see what critics (current and former employees) are saying, you can go to Glassdoor.com. Dave prefers ZipRecruiter, but also check out job postings on Indeed, Ladders, Monster to get an idea of what’s out there to see what’s trending and what skills are in demand. But you say: ‘Job boards? – been there done that, haven’t found anything’. Well try this trick for online job searches (or for any online search): flip your search keywords around to get slightly different results. Remember, use job boards as just one of your tools, not a cure-all. Not all jobs are listed on job boards and some can even be hidden from you through search engine algorithms. If your trash goes out more than you do, then you have a problem. Plain and simple – you need to get out more! Technology has made it way too easy for us to be consumers of experiences and information in the comfort of our own home. One great way to meet face to face with those who may be able to help you are thousands of networking groups, associations, industry groups and special interest organizations that may fit your interests. These can be: local chambers of commerce, career transition groups, niche focused casual meet up groups that exist for a specific reason – to grow business or promote a special interest. These could be opportunities for meeting the right person who can help guide you in the right direction. Remember, the narrower your niche, the better you’ll meet the right people. Randomly trying to connect with anyone and with as many people as possible will dilute your energy and focus, so find a group that shares your interests and goals. You will more likely find people who will recognize your experience and skills. Getting out of house to meet new contacts can be uncomfortable and inconvenient. To make it part of your routine, Dave suggests that you allocate certain days to network. You might even take it a bit farther and schedule time to reach out to people for a few minutes every day. As professionals, it sometimes goes against our nature to ask for help because it may give us the feeling of vulnerability. Ask for help but make sure you are not just looking out for yourself, but also be giving and thinking of what others need. Be the solution that companies are looking for. Don’t say you’re out of a job, but that you’re exploring a new adventure, or looking for new options. Frame your situation differently and turn it around to positive. 1. Show up! Get there early before the meeting when everyone is fresh. 2. Bring a business card! A good quality card, not cheap looking. This helps to make it easy for them to remember you if they ask for a card. 3. Find commonality! Don’t get too serious and pull out your resume right away. Be ready to find a way to connect easily with someone new on a personal level. Be prepared to chat about your interests, family, movie, school, hometown, hobby, food, sports, (Dave often uses his personal likes of movies, wine and cigars). 4. Be likeable! Instead of trying to be interesting, be interested in others. Ask questions, but it must be genuine and not feel like an interrogation. 5. Ask: ‘Who do you know?’ ‘Do you know anyone who might know a contact or have connections at XYZ company?’ You might not get an immediate intro to the right job, so expect to go through several degrees of separation to find the right company/position. Dave emphasizes to keep looking for what you want, everywhere and anywhere. People are willing to help, but if you show uncertainly on what you are looking for, it will be harder for them to relate to you and your situation. It’s up to you to make it easy for them to help, so give them an idea of what you can do, where you want to work and what value you bring. The more specific you are, the more likely you’ll be guided to the right people. So, there you have it – time tested tips to find your new opportunity, but you must take action. It’s another new year, don’t think about it too much, do something now to get your career going! Looking for a place to grow personally and professionally? This is a major provider of HR and Human Capital Management Solutions for small, medium and large organizations. Paychex has been rated for the 9th time as one of the most ethical companies by The Ethisphere Institute; and as Best Employer for Healthy Lifestyles for the 7th time by the National Business Group on Health. Need help getting started? You might not know that Goodwill is not just a retail store but an organization that provides opportunities which serve community needs and help professional job seekers become self-sufficient and put people back to work. The Goodwill Career Center offers free career coaching, resume critiquing, job leads from employers, mock interviews, and digital skills training classes from beginning to advanced in 3 locations in Phoenix. Detail oriented? Like to put things in their right place? Good at recognizing patterns? Or like to teach? GCU is looking for instructors if you have master’s degree, they’re also hiring for corporate university positions. For those want to change careers and go back to school for IT, there is a 16 week Coding Bootcamp that almost guarantees successful employment! College credit for bootcamp. $11,500 to $20K. Should you post your resume online? It was amazing, you guys did a great job! I found several potential companies! After a company layoff thrust me into the job market, Career Connectors was exactly what I needed to develop my networking skills. Networking is a job in itself, and the skills I learned helped me to land a temporary position just three months later that is now permanent. I believe in the Career Connectors mission and continue to volunteer as a way of expressing my appreciation for their support during a very tough time…thank you Career Connectors! Good news. I have landed. Thank you for your support throughout my job search journey. You and your organization has lots to offer besides the positive energy, uplifting of self confidence and immense networking opportunities. I am very appreciative of the efforts and time put forward by you and your team. After one year of unemployment, I have been employed with an excellent company at a job which is perfect fit for my experience and desires for many months, through the efforts of the devoted volunteers at Career Connectors. I and my family are eternally grateful. Sincere thanks! © 2019 · Career Connectors. All Rights Reserved.